Finally Friday is here! It's been a long week and I've been looking forward to this weekend as I'll be watching movies with my girls later today. 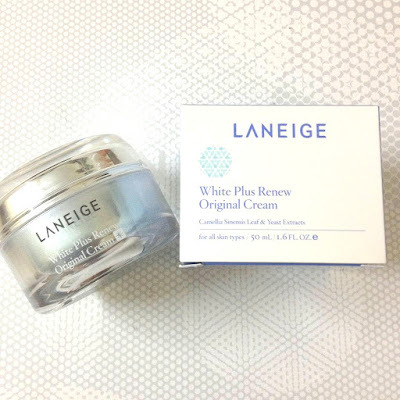 But before I went on to turn up the radio to get ready, I'm gonna do a review on this moisturiser that I've been using for the 5 months, White Plus Renew Original Cream from Laneige. 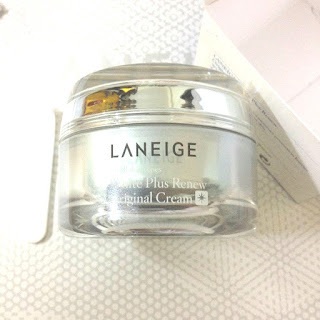 A brightening and moisturizing cream that instantly hydrates dry skin and brightens it with a layer of radiance. MelaCrusher™ technology that went into the making of this cream promotes the self-destruction of melanin pigments, keeping the skin always looking radiant and healthy. What's MelaCrusher™? 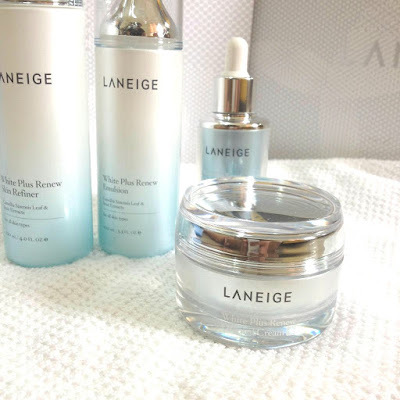 Go to my previous review on the toner or emulsion. Scoop out using spatula provided, a suitable amount (about 0.4 ml) into palm and apply as part of basic skincare routine in morning and at night. Gently rub on cheeks, forehead, nose, outer mouth and neck, and warm them afterward with palms. 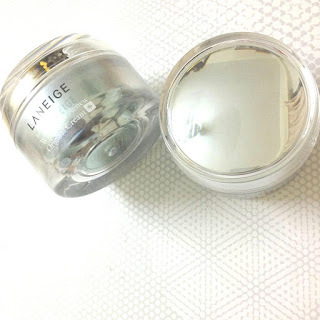 A brightening cream that securely locks in moisture inside the skin, while protecting it with a radiant layer. Water, Butylene Glycol, Glycerin dimethicone, Cyclopentasiloxane, Niacinamide, Cyclohexasiloxane, Ascorbyl Glucoside, Camellia Sinensis Leaf Extract, Yeast Extract, Hydroxyethyl Acrylate/Sodium Acryloyldimethyl Taurate Coplymer, Cetylethylhexonoate, Hydrogenated Polyisobutene, 1,2-Hexanediol, Dimethiconol, Trisiloxane, Cetearyl Alcohol, Glyceryl Stearate, Inulin Lauryl Carbamate, Polyacrylate-13, Ammonium Acryloyldimethyltaurate/VP Copolymer, PEG-100 Stearate, Polyisobutene, Stearic Acid, Hydrogenated Lecithin, Ethylhexyglycerin, Polyglyceryl-3, Methylglucose Distearate, Polysorbate 20, Caprylyl Glycol, Disodium EDTA, Fragrance. 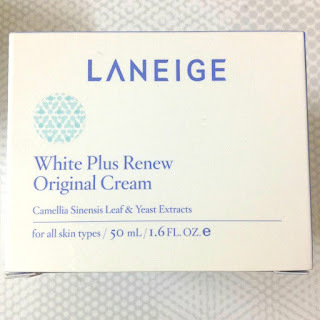 Like other sister products, this one too comes in a similar box with that turquoise in color circle, signifying it belongs to White Plus Renew skincare line. 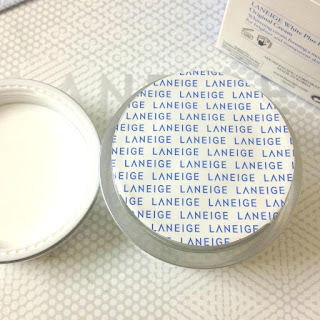 The sticker right there indicates that mine is imported from South Korea by Laneige Malaysia. The product comes in a jar, along with product leaflet and a spatula. See the lid? It works like a mirror I tell you. As I read in Laneige magazine, in Korea, they have this thing called "moon jar", it's actually just a white porcelain but it's shaped like a full moon and it shines like one too. Looking at the lid, it totally gives the idea of as if you're looking at a full moon and as you see yourself at it as it works like a mirror, so yeah.. makes you feel like you're pretty like the moon and so white like a porcelain... especially porcelain skin is something that every woman in that country want to achieve so.. Totally dig that concept. The jar has the same metallic turquoise color as the toner and the emulsion from the same line, with label and basic info of the product at the side of it. At the bottom, there's the manufacturing date. Note that I bought this moisturiser back in March and this one comes from a batch manufactured in February. Awesome! The product is sealed before open so do check before purchase. 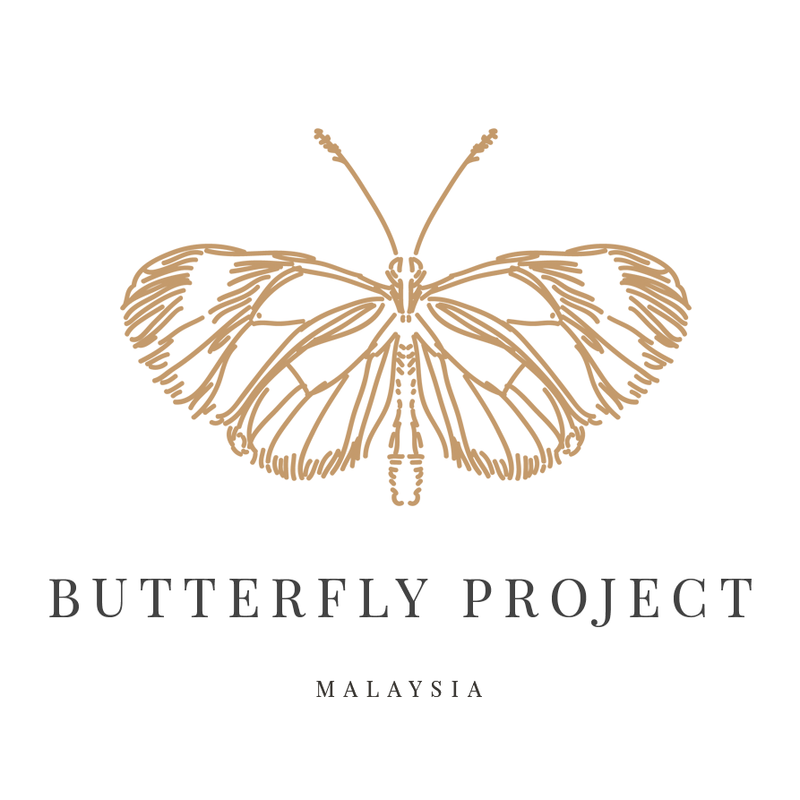 The ones come to Malaysia is sealed with that pattern so if you got from somewhere else and got a different kind of pattern, maybe you need to check with the place you got yours from. 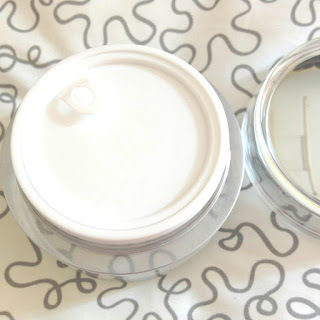 The jar also comes with a plastic lid that keeps the product from spilling and its freshness. That's how the cream looks like. It's white, slightly transparent and not runny at all. 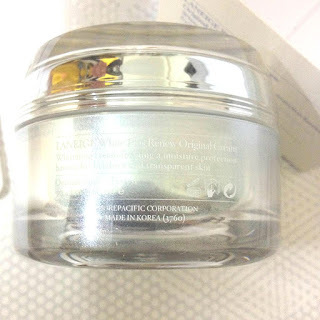 The texture is slightly lighter than what I was expecting for a moisturiser but still thicker than the emulsion so I guess it's perfect for its job to lock in the moisture and brightens the skin tone at the same time. 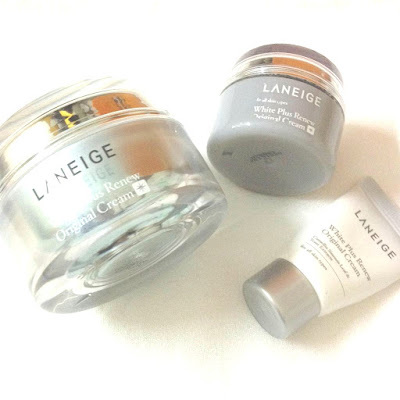 Works with my normal-oily combination skin just fine. It's not sticky at all. I was informed that this product is for all skin types. This product does contains fragrance but as it sits at the last place on the ingredient list, I assume it's low in content but if you're not into fragrance-containing products, this one may not for you. But to me the scents is so nice and tranquilizing. After finishing two tubes of 10ml from the trial kit, one jar from the trial set and one jar of a full-sized product within 7 months, I have to say, I really love it! 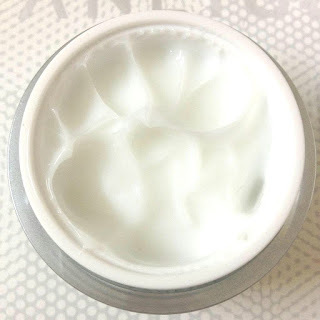 The texture, the scent, and of course how it works with my skin! 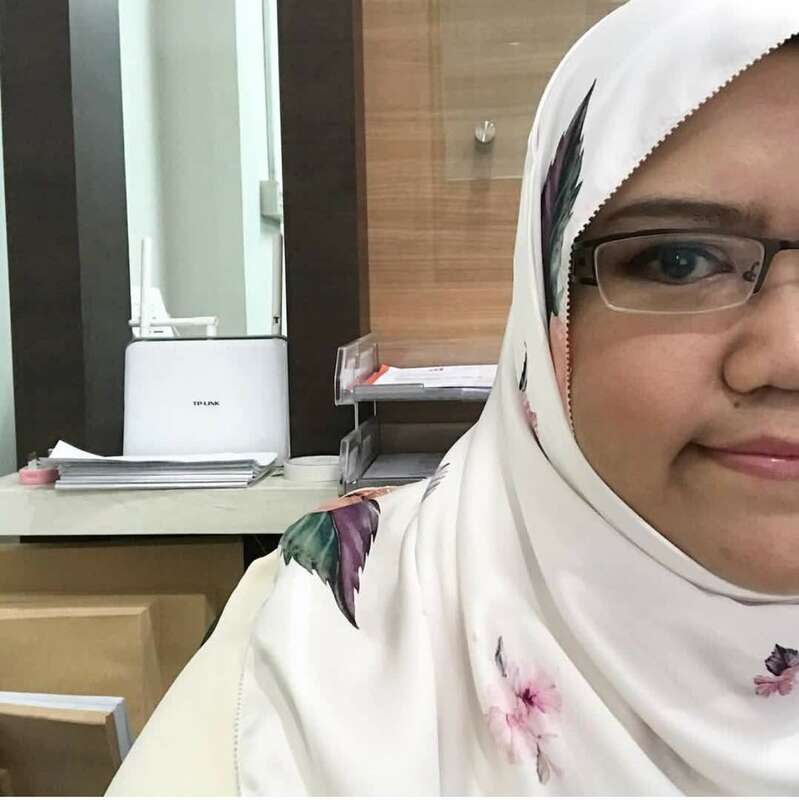 Of course, layering products can be tricky and I do notice the difference if I layer one product after another right away as compared to when I give it some time to apply before the essence being fully absorbed into my skin. I have to say, do give it like a minute before applying the product in order not to feel 'heavy' on your skin. I applied this twice a day, in the morning and at night as a final step in my skincare regime. 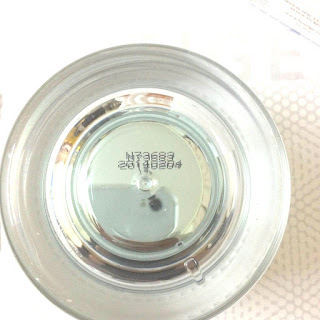 By the way, if you're using a Spot Treatment from the line or any other brand, bear in my in mind not to spread this product in normal way but to take small amount of it and tap lightly on the area that you applied the Spot Treatment with. This is merely because the texture of my Spot Treatment (mine from this skincare line as well) is quite thick and takes time to be absorbed into my skin. Based on the ingredients list, as the product contains Cetearyl Alcohol which is known as irritant and cause acne, but fortunately I didn't break out because of it. I'll definitely gonna show you guys the result of using the whole White Plus Renew line when I'm done reviewing the products that I'm using. 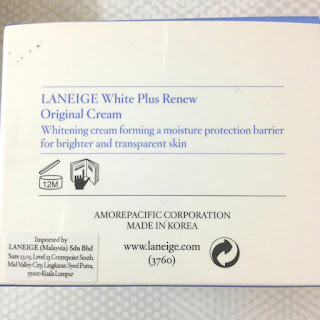 The retail price here in Laneige counter at major departmental store i.e. Parkson, AEON and Isetan is RM165. Oh, I checked out at Sephora the other day, and they do carry this brand and particular skincare line as well. 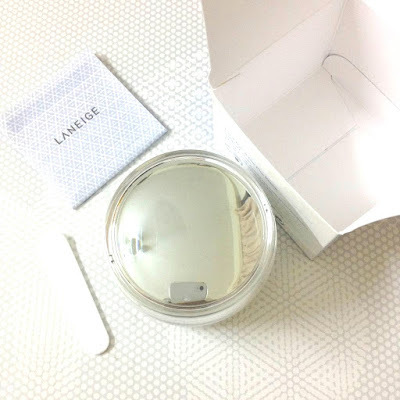 Though I'm not sure if Sephora have Laneige membership apart from the Sephora White or Black Card program. So that's it! What do you think? Do tell if you ever tried this product or if you want to try it!